A person could write a book about the things to see in the Wizarding World of Harry Potter. For this post I will focus on my family’s favorite attractions, entertainment and food that we enjoy while visiting Universal Orlando. 1. Pre-purchase a ‘My Universal Photos’ package. You can choose from one or three day photo packages and these photo packages will allow you to download all of your attraction photos as well as any photos that you have taken by the Universal, photographers while you are in the park. 4. Catch a stage show in Diagon Alley. Watch one of several shows put on in Diagon Alley. These stage shows are entertaining for Harry Potter fans & also a good way to take a break from the walking & the heat while enjoying a frozen butterbeer. The current performances are “Celestina Warbeck and the Banshees” and “The Tales of Beedle the Bard”. 5. Buy a Wand. You can purchase a wand in Ollivander’s Wand Shop in either Diagon Alley or Hogsmeade. The shop in Hogmeade has a little pre-show that you can go to prior to entering the shop, but sometimes the line for the show can be daunting. There are numerous styles of wands and two different types of wands, normal and interactive. The interactive wands come with a map that shows you where to go and how to wave your wand. If you do it just right, you will achieve interesting, animated results. UPDATE: Dragon Challenge is currently under renovation and an opening date has not been announced. 12. Watch the Frog Choir Perform. Be sure to catch a performance of the Frog Choir on the stage in Hogsmeade. Ask one of the wizards working that day for times of the performances. The Frog Choir is very entertaining to watch and one of our favorite performances in Universal. During the holiday season they perform seasonal music. 14. Have a meal at the Three Broomsticks or the Leaky Cauldron. Be sure to enjoy a wizard meal and the wonderful theming inside one of the restaurants in the Wizarding World of Harry Potter. They both look very similar and have similar menus. The Three Broomsticks is located in Hogsmeade and has a larger seating area than the Leaky Cauldron in Diagon Alley. Menu choices consist of things like “Toad in the Hole” and “Bangers and Mash”. Three Broomsticks has a ‘Great Feast’ platter that is said to feed four, but I think it could feed a family of six. 15. Visit the Shops & Mail a Letter. be sure to explore the shops in both Diagon Alley and Hogsmeade. All are wonderfully themed and really take you inside the, awarding winning, Harry Potter Novels. No purchase necessary just to wonder around inside the stores. 16. Download the Universal Wait Times app before going to the park. This app will keep you updated with ride wait times and closures and also allow you to save your spot in line for the virtual queue at the Jimmy Falon attraction. 17. Listen for Moaning Myrtle in the Hogsmeade bathrooms. The bathrooms just outside of the Three Broomsticks restaurant are haunted by Moaning Myrtle. 19. Interact with the Wizards hired to work there and be sure to ask them for a picture. 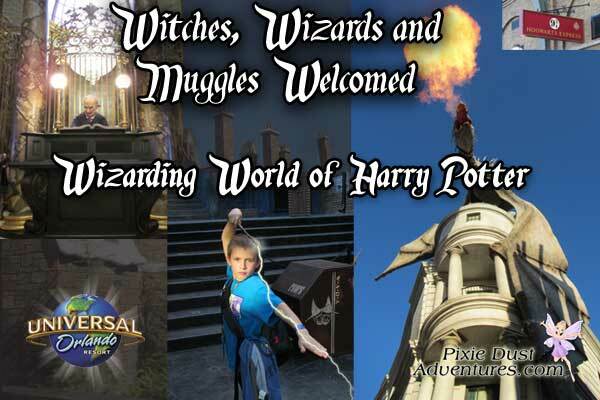 Universal has done a wonderful job hiring entertaining wizards to work around the Wizarding World of Harry Potter. Melissa Mathies – Pixie Dust Adventures, your Universal Parks & Resorts Specialist.